The Government of Barbados has discontinued the Tropical Storm Warning for Dominica. The Government of St. Lucia has discontinued the Tropical Storm Warning for St. Lucia. The Government of France has discontinued the Tropical Storm Warning for Guadeloupe and Martinique. * St. Vincent and the Grenadine Islands. A Tropical Storm Watch means that tropical storm conditions are possible within the watch area, in this case within the next 36 to 48 hours. Interests along the coast of Venezuela and Colombia should monitor the progress of Matthew. For storm information specific to your area, please monitor products issued by your national meteorological service. At 500 AM AST (0900 UTC), the center of Tropical Storm Matthew was located near latitude 14.0 North, longitude 64.7 West. 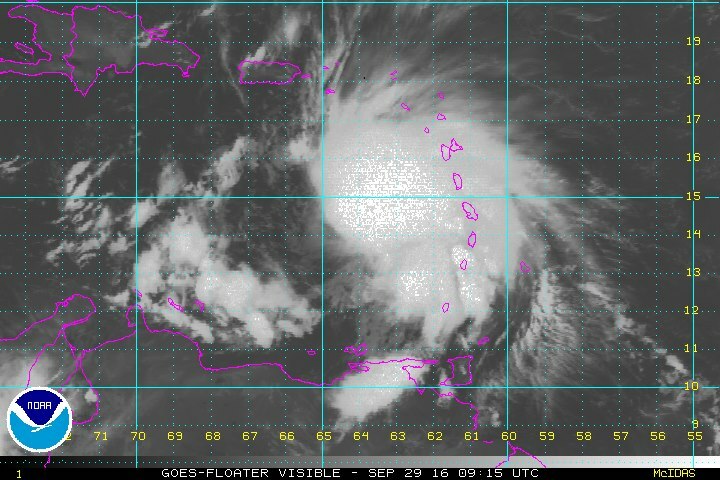 Matthew is moving toward the west near 16 mph (26 km/h), and a general westward motion is expected with some decrease in forward speed during the next couple of days. On the forecast track, the center of Matthew is forecast to pass to the north of Aruba, Bonaire, and Curacao on Friday. Maximum sustained winds are near 65 mph (100 km/h) with higher gusts. Gradual strengthening is forecast during the next 48 hours, and Matthew is forecast to become a hurricane Thursday night. Tropical-storm-force winds extend outward up to 185 miles (295 km) primarily to the north and east of the center. WIND: Tropical storm conditions are possible in Bonaire, Curacao, and Aruba beginning late today. RAINFALL: Matthew is expected to produce total rainfall accumulations of 4 to 8 inches across the Windward Islands and southern portions of the Leeward Islands through Thursday. These rains may produce life-threatening flash floods and mud slides. Rainfall totals of 1 to 2 inches are expected farther to the north into the northern Leeward Islands, including the United States and British Virgin Islands and Puerto Rico. Rainfall totals of 1 to 3 inches are expected over Aruba, Bonaire, and Curacao through Friday.